It seems like almost every day you hear of another deadly fire incident happening somewhere. It can be caused by faulty wiring, an unfortunate kitchen accident, an act of nature or simply the result of carelessness. And, regardless of what caused it, almost everyone can agree with the fact that house fires are on top of the list of any homeowner’s list of possible nightmare scenarios. Yet, despite how dangerous house fires are, there’s one thing that could have made such accidents less disastrous and that’s if fire sprinkler systems were present and working. 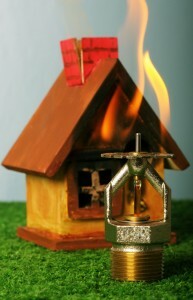 In the United States alone, about 2,600 people die each year due to home fires. However, according to the National Fire Protection Association (NFPA), the use of smoke alarms and fire sprinkler systems reduce the risk of death by as much as 82%. Loss of life aside, it doesn’t take any kind of research and statistics to say that house fires cause immense damage to properties. But, again, the presence of smoke alarms and sprinkler systems cut down the damage many times over, from an average of $45,000 for homes with no sprinkler systems to $2,166 in those with sprinkler systems, according to the Home Fire Sprinkler Coalition. Despite the glaring and somewhat obvious evidence of how sprinkler systems can actually save lives, many homeowners still do not believe in having their houses fitted for such sprinkler systems. For one, there are those that believe the sprinkler systems can actually cause much more damage than the fire itself. This belief may have started due to a number of reasons, mainly due to the fear of the sprinklers leaking or going off accidentally, causing water damage. While such fears are warranted, they’re not exactly true, as all sprinklers are tested during and after installation. Also, not all sprinkler heads go off in case of fires. Most of the time, just one sprinkler head is enough to contain fires. Another likely reason why even the most safety-conscious homeowners shy away from sprinkler systems is because of the perceived aesthetic and financial issues. Both misconceptions are slowly becoming less of an issue as fire sprinkler systems have become more available, cheaper and less conspicuous. Besides the fact that sprinklers save lives, most insurance companies offer generous discounts for homes fitted with fire sprinkler systems. Also, sprinklers may allow homeowners to qualify for a tax rebate. The resale and appraisal value of the home also goes up because of the sprinkler systems, which is good for those who’re looking to prepare for selling their house someday, or those who simply want to qualify for bigger loans down the line. Certain communities around the globe also have started to require new homes to be fitted with sprinkler systems, and it’s only a matter of time before sprinklers become mandated in most communities. With fire sprinkler systems, you are not only potentially saving your life and those of your family, but also you end up saving more money in more ways than one. And, when both things are considered, there’s really no reason NOT to have a sprinkler system installed in your lovely home. When most people think of fire suppression systems, they tend to immediately think of active suppression – sprinklers and extinguishers, in particular, come to the minds of many people. While these are important parts of a fire suppression plan, they’re not the only parts. Fire suppression is a science, and there are many components that a skilled suppression system designer will integrate into a solution. 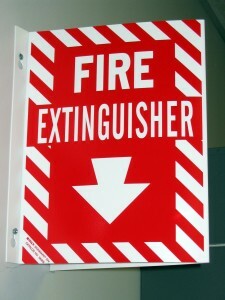 – Once the alarm is triggered, relatively low tech devices such as fire hydrants, fire buckets, and fire axes may be made available depending on the nature of the space – in some cases, straight forward fire extinguishers may be able to extinguish a fire before the full suppression system is activated. 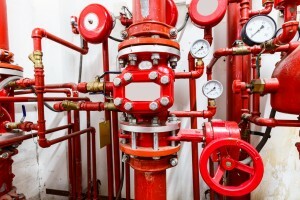 – Suppression systems can be designed to make fire fighting easier for fire professionals – placement of fire hydrants and plumbing of pipes for fire fighters can help protect a business in case of fire. Beyond active components, a properly designed system will incorporate passive components – such as firewalls, fire-stops, grease-ducts, and fire-rated materials to help slow the spread of fire, and limit exposure, and protect high risk materials from heat and flame sources. While these components will not necessarily stop a fire, they can help prevent or slow a fire so that professional fire fighters can more easily contain it. 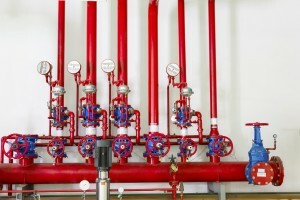 Properly designed fire suppression systems involve quite a bit more than simple sprinklers and fire extinguishers – if you have people or assets to protect, speak to a professional suppression system designer to make sure that your suppression plan is adequate to both protect your assets and comply with regulations.